This has been a strange month. I’m pretty sure I’ve spent half of it being sick! Being sick can be dangerous for our home and the organizing tools and systems I have. Because when I can’t be up doing, I’m down thinking and thinking usually leads to ideas, and not always the best ones. So, instead of letting myself get carried away with ideas, I decided to just keep working on my HMB. Which brings me to this week’s section. You could also call this the Cleaning section, or Home Maintenance section, I just call it Home Care. 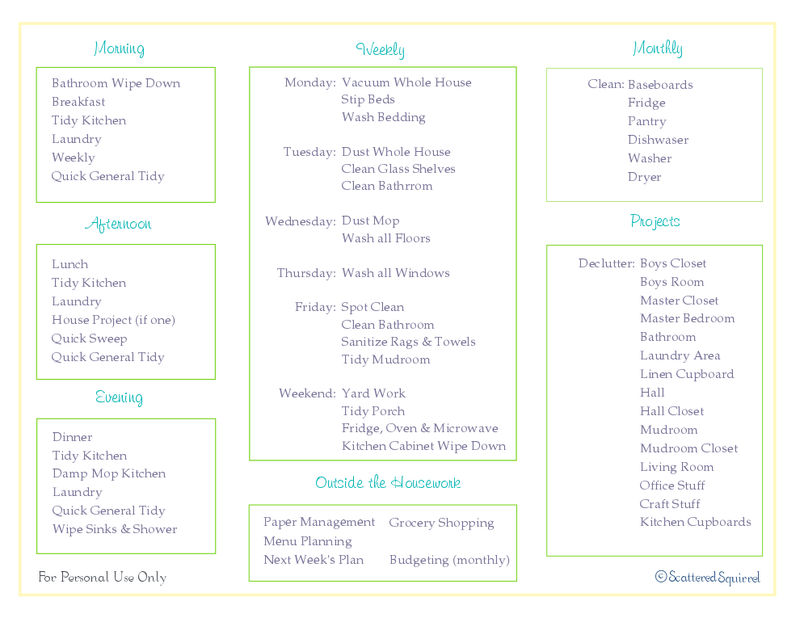 To start this section off, I have my cleaning schedule. I used to keep a copy in here just because, but now that I have and am using my office space more and more, I find that I’m using my HMB more to help me plan my week. 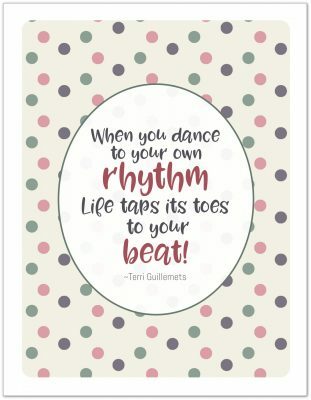 I haven’t updated this printable yet, as I’m still trying to find the right rhythm in our new home, but I spent much of my down time contemplating this, so don’t be surprised if I revisit this again at a later time. After this printable comes the Home Maintenance pages. 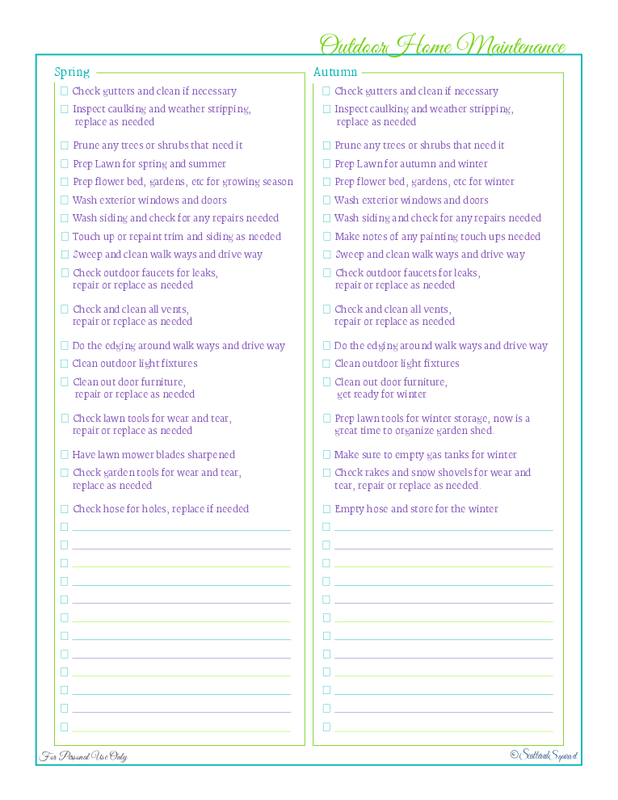 These are just simple checklists I created to help keep on top of all the little things that need to be done around the house. 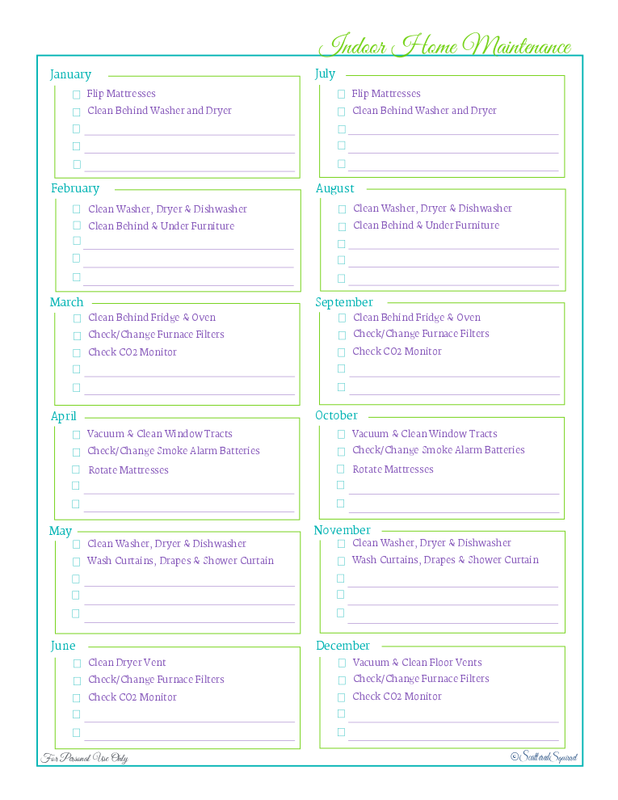 The first is a yearly checklist for indoor things that need to get done. Breaking down month by month helps me schedule these items into my normal routines. This is exactly the same as the old one, I just updated the colors and the fonts. (stay tuned for a fonts post coming in February) I couldn’t think of anything else to add to it, and there wasn’t really anything I needed to change up. So a quick refresh was all it got. Next up, is my check list for outdoor maintenance. When I think of the exterior of my home, I tend to think in terms of seasons. The bulk of the maintenance outside gets done in two big chunks; first to get ready for spring and summer and then to get ready for autumn and winter, so here’s what I came up with. As you can see I broke it into two, Spring and Autumn. With only a few minor differences, allowing for the changing of the seasons, they’re pretty much the same. Basically, it’s to remind me to keep an eye on things. As a former home owner, this was always something I took care to try to keep up on, as a renter now, I think it is just as important. Noticing the small problems, before they grow to HUGE problems is always a good thing. Because I’m still working out the kinks in my new cleaning routines, I don’t have much more in this section. I’m not sure what else I would keep in here, so I’m open to suggestion. I do have one more printable to share though. I don’t know about you, but I have a love-hate relationship with laundry. My biggest laundry pet peeve is special washing/laundering instructions that come with certain items. However, as I’ve gotten older, I’ve begun to embrace the fact that sometimes I don’t mind having to take special care of an item I love. Up until now, I’ve kept a list of these items, along with notes about how to care for them, scribbled on some lined paper in my HMB, and some were hard for me to decipher. 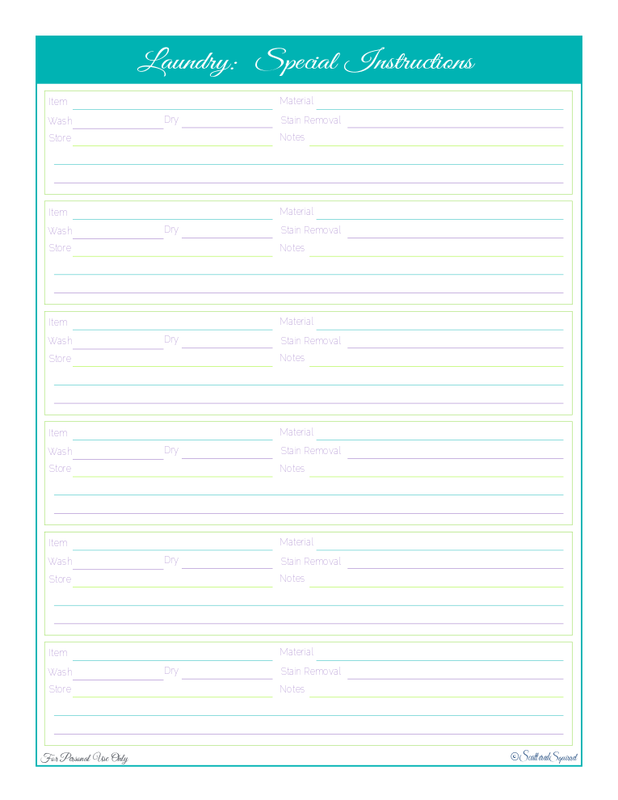 So, whipped up this little baby to help me keep track of all that. For now I’m keeping it in this section of my HMB, until I figure out how to store it in the laundry room. Most of the items on the list are things that I wanted to remove the care instructions tag from. Cloth napkins, curtains, table linens, scarves … you get the point! I find myself referring to this page at different times throughout the year, though not too often. The more times I need to wash an item, the more I tend to remember what to do with it. Still, it’s always nice to have this, for those just in case moments. If you would like a copy of any of these printables for your own use, just click the pictures to download. And that is the Home Care section of my HMB. I know it’s really boring, but sometimes, for myself anyway, less is more. What about you? Do you have more in this section? If so, what sort of information do you keep in it? These are all great but do you have blank List concerning chores? I have a few blank ones. You can find them on the Printable Index, up on the top menu bar. Right now that’s the easiest way to find them.